Chabad emissaries aim to reach tourists, businessmen, and aid workers in two African countries. 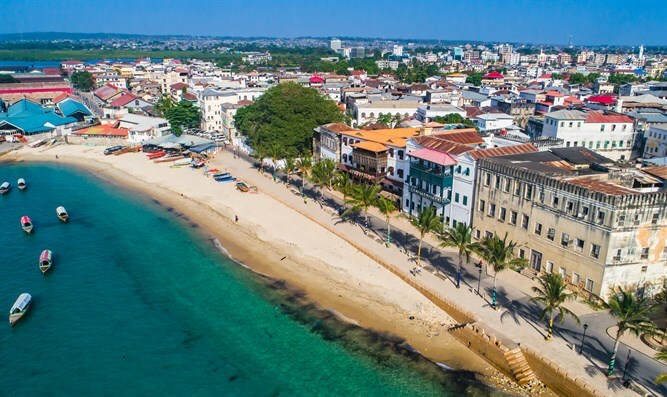 Chabad announced the opening of two Jewish centers in Africa, on the island of Zanzibar off Tanzania’s coast on the continent’s east and in Cote d’Ivoire. In Zanzibar, a predominantly Muslim former sultanate that used to have major roles in the slave trade and the international spice industry, Rabbi Shneor Shmulevitz and his wife, Mushka, set up shop earlier this year with the intention of opening a synagogue and visitors center, the Chabad.org reported last week. The couple have an 8-month-old son, Menachem Mendel. They opened the Chabad House of Zanzibar in the coastal resort town of Nungwi. In addition to tourists, Chabad houses in Africa also cater to a varied group of Jews ranging from businessmen involved in the minerals trade and security industries to aid workers and volunteers. Tourism in Zanzibar has multiplied by a factor of 20 since the 1980s with nearly 400,000 foreigners traveling to the island in 2017, including many Israelis and Jews. Shmulevitz held a Rosh Hashanah dinner last year that drew 200 guests. A similar number showed up at the palm-leaf-covered sukkah and beachside Passover seder the couple held last year. In Western Africa, Rabbi Yerah Bensaid and his wife, Debbie, who grew up in the Democratic Republic of Congo, are setting up a Chabad house in the Ivorian capital of Abidjan, Chabad.org noted. Their center in West Africa will be the seventh permanent center under the umbrella of Chabad of Central Africa, joining the neighboring countries of Ghana and Nigeria. A center opened in Uganda at the end of 2017, and one in Tanzania earlier this year. Debbie Bensaid is the daughter of Rabbi Shlomo and Miriam Bentolila, who head the Africa operations for the Chabad-Lubavitch movement.